Ohio State University – For the first time, researchers have found a way to inject a precise dose of a gene therapy agent directly into a single living cell without a needle. The technique uses electricity to “shoot” bits of therapeutic biomolecules through a tiny channel and into a cell in a fraction of a second. They report successfully inserting specific doses of an anti-cancer gene into individual leukemia cells to kill them. They have dubbed the method “nanochannel electroporation,” or NEP. Researchers at Ohio State University have discovered a way to deposit gene therapy agents in living cells without the use of a needle. Images courtesy of Ohio State University. Above, two tiny reservoirs (measured in micrometers, or millionths of a meter) are connected by a nanometer- (billionth of a meter) sized channel, which is too small to be seen at this magnification. There have long been ways to insert random amounts of biomaterial into bulk quantities of cells for gene therapy. 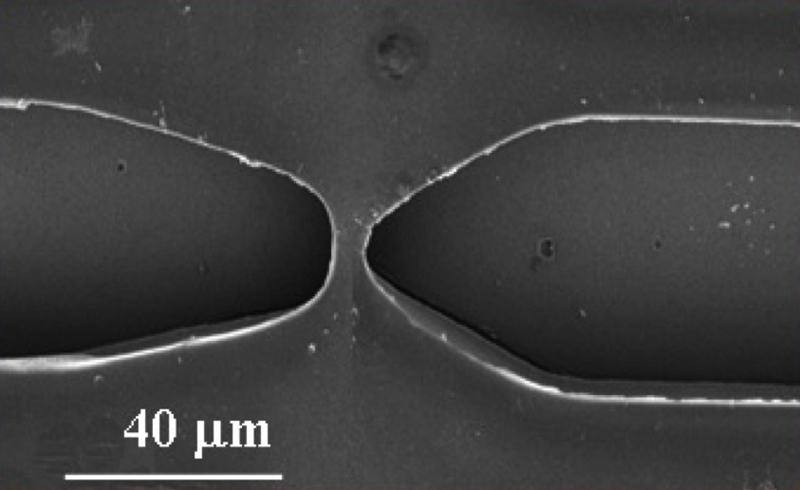 And fine needles can inject specific amounts of material into large cells. But most human cells are too small for even the smallest needles to be of any use. NEP gets around the problem by suspending a cell inside an electronic device with a reservoir of therapeutic agent nearby. Electrical pulses push the agent out of the reservoir and through a nanometer- (billionth of a meter) scale channel in the device, through the cell wall, and into the cell. Researchers control the dose by adjusting the number of pulses and the width of the channel. In Nature Nanotechnology, they explain how they constructed prototype devices using polymer stamps. They used individual strands of DNA as templates for the nanometer-sized channels. Lee invented the technique for uncoiling strands of DNA and forming them into precise patterns so that they could work as wires in biologically based electronics and medical devices. But for this study, gold-coated DNA strands were stretched between two reservoirs and then etched away, in order to leave behind a nano-channel of precise dimensions connecting the reservoirs within the polymeric device. Electrodes in the channels turn the device into a tiny circuit, and electrical pulses of a few hundred volts travel from the reservoir with the therapeutic agent through the nano-channel and into a second reservoir with the cell. This creates a strong electric field at the outlet of the nano-channel, which interacts with the cell’s natural electric charge to force open a hole in the cell membrane – one large enough to deliver the agent, but small enough not to kill the cell. In tests, they were able to insert agents into cells in as little as a few milliseconds, or thousandths of a second. First, they tagged bits of synthetic DNA with fluorescent molecules, and used NEP to insert them into human immune cells. After a single 5-millisecond pulse, they began see spots of fluorescence scattered within the cells. They tested different pulse lengths up to 60 milliseconds – which filled the cells with fluorescence. To test whether NEP could deliver active therapeutic agents, they inserted bits of therapeutic RNA into leukemia cells. Pulses as short as 5 milliseconds delivered enough RNA to kill some of the cells. Longer pulses – approaching 10 milliseconds – killed almost all of them. They also inserted some harmless RNA into other leukemia cells for comparison, and those cells lived. At the moment, the process is best suited for laboratory research, Lee said, because it only works on one cell or several cells at a time. But he and his team are working on ways to inject many cells simultaneously. They are currently developing a mechanical cell-loading system that would inject up to 100,000 cells at once, which would potentially make clinical diagnostics and treatments possible. “We hope that NEP could eventually become a tool for early cancer detection and treatment – for instance, inserting precise amounts of genes or proteins into stem cells or immune cells to guide their differentiation and changes – without the safety concerns caused by overdosing, and then placing the cells back in the body for cell-based therapy,” Lee added. He sees potential applications for diagnosing and treating leukemia, lung cancer, and other tumors. He’s working with researchers at Ohio State’s Comprehensive Cancer Center to explore those possibilities. Many transfection techniques can deliver biomolecules into cells, but the dose cannot be controlled precisely. Delivering well-defined amounts of materials into cells is important for various biological studies and therapeutic applications. Here, we show that nanochannel electroporation can deliver precise amounts of a variety of transfection agents into living cells. The device consists of two microchannels connected by a nanochannel. The cell to be transfected is positioned in one microchannel using optical tweezers, and the transfection agent is located in the second microchannel. Delivering a voltage pulse between the microchannels produces an intense electric field over a very small area on the cell membrane, allowing a precise amount of transfection agent to be electrophoretically driven through the nanochannel, the cell membrane and into the cell cytoplasm, without affecting cell viability. Dose control is achieved by adjusting the duration and number of pulses. The nanochannel electroporation device is expected to have high-throughput delivery applications.